As it can get a bit confusing at times. 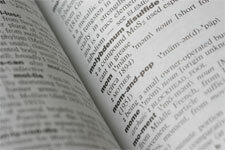 All those abbreviations and terms used in online marketing. Hereby an overview of frequently used terms. What do the abbreviations SEM, SEA and SEO mean? Search Engine Marketing. Everything that has to do with the visibility of a website on a search results page and the engagement with the result. From the organic results to the ads above, on the side and even below it. Search Engine Advertising. Ads placed via either Google Ads or Bing Ads. The bidding system makes that the combination of the quality of the ad (and advertising website) and the price paid determine the position on the page. Search Engine Optimization. Refers to positively influecing the position of a website among the search results. This by means of optimization of the website itself and the links referring to it from other sites. What do the abbreviations CPC, CPM, CPS and CPL mean? Cost Per Click refers to the costs associated with every time a user clicks on an ad. Cost Per Mille refers to the costs associated with 1000 views of an ad. For the publisher rather than the advertiser, RPM stands for the Revenue Per Mille as it’s not about the costs but the revenue received. In case of Cost Per Sale, for example through an affiliate network, the advertiser agrees to pay a commission for every sale that takes place following the click on an ad. This can be a fixed sum or a percentage of the sales value. Cost Per Lead is similar to CPS. With the only difference being that it’s not about the value of the final sale, but of a lead that is generated. For example, someone subscribing to a newsletter. Or becoming a free member. Of fills in a form with his or her contact details for a follow up call. Click Through Rate refers to the number of times an ad was clicked, divided by the number of times it was viewed (clicks/views). For example, for optimizing Adsense ads it’s important to strike a balance between CTR and above mentioned RPM. This is definitely one of the online marketing terms that seems to trigger discussion when it comes to its definition. This is probably because the meaning depends on the context. When we talk about the conversion rate of visitors, we’re referring to the percentage of all visitors with the potential to convert, that actually does so. For example, by subscribing to a newsletter (something a visitor in general does only once). When we talk about visits, then conversion rate refers to the percentage of all visits with the potential to convert, that actually does so. For example, by placing an order. This can happen during each and every visit again. Backlinks are links from other websites to yours. Usually the distinction follow or nofollow is made. Follow refers to normal links pointing from A to B. In case of a nofollow link, a rel attribute is added to the link to specify the relationship between site A and site B. The relationship nofollow describes is that search engine crawlers are instructed not to follow this link as part of their indexation and ranking effort. I.e. that this link shouldn’t count towards the Pagerank of site B. Actively acquiring new backlinks is called linkbuilding. Pagerank is the value that Google assigns to pages on a domain based on, among others, backlinks, traffic, content and a number of other variables. Note 1: A higher Pagerank is no guarantee for ranking higher among search results. Note 2: The word Page doesn’t come from the idea of a page but from the creator of the concept, Larry Page. The abbreviation SERP stands for Search Engine Results Page. Nothing more than the page with search results for a specific query really. Affiliate marketing is the term used for the collaboration between publishers and advertisers, usually through an affiliate network (like Tradedoubler, Tradetracker or Awin). This network facilitates the exchange of advertising material and tracking of results. Once a publisher is approved by an advertiser, making use of their advertising material is simply done by retrieving it directly from the network without further intervention of the advertiser being needed. Know of any abbreviations missing from the above? Let me know in the comments.